I pictured my ideal site design for Peer & Social Lending frequently over the last few months. It was obvious to me that the simple blog style didn’t fit for the content I was providing. With the previous site, I imagined new readers coming to my site, glancing at the most recent article and being completely overwhelmed and confused – frustrated, the reader left, never to return again. There had to be a better way. Working with my limited budget, I put my plans in action and what you see today is the result. I’m very happy with the result and it is something I’m proud of. There are still some tweaks to make and you will likely see several more changes over the next few weeks if you frequent my site. My focus is to continually make changes to improve the reader experience. You will see two new tabs at the top of the page. The news view will provide you just that – a well organized display of many posts you may be interested in reading. If you are a regular reader, you may prefer the simple blog view to make sure you are all caught up. I also want to say thanks to all of my readers and those who have supported me. The comments, the emails and the personal connections continue to keep me motivated to keep it up. I hope you enjoy the new site as much as I do. I like the new look but can you put PEER & SOCIAL LENDING on one line in your header. Three separate lines of a big font is a large waste of space and you have to go down 1/4 of the page for any real content. Thanks for the feedback. I agree that the heading is too big and it is on my list to change. As part of the site redesign I was hoping to bring in a professional logo/brand designer, but I just couldn’t swing the cost. In the meantime, I’ll come up with a solution to make it so it takes up much less space. I like the new look too. Not a big issue, but I agree with wpscott. On smaller screens that large logo is a pain. Thanks JJ – appreciate the feedback. See my reply to wpscott, I’ll get this figured out. P2P lending in 2017 » What does the future hold? 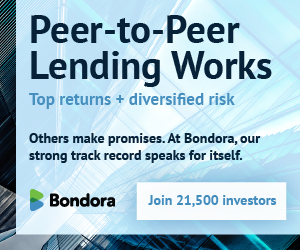 Like Peer & Social Lending?